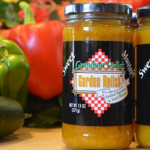 Grandma Della’s Garden Relish is the best gourmet relish you have ever tasted. This relish is truly a pioneer product, being called “Mustard Pickles,” when canned buy our pioneer families. In that tradition our family brings back the flavor of the vegetables – Cauliflower, Red and Green Peppers, Onions and Cucumbers in a sweet mustard sauce to be enjoyed not only by the generations that were raised with this delight on the table, but also a new and delicious flavor for generations to come. Grandma Della’s Garden Relish will replace the use of mustard in recipes; such as, Potato Salad, Deviled Eggs, Meat Loaf and Meat Casserole’s, the new flavor will be exciting. Our Special relish also can be used on the simplest of foods; such as, Hamburgers, Hot Dogs and Sausages. It has been a pleasure to share a special product from our family to yours. Della Enterprises was founded in 1998 by Greg Paxton. Greg had a deep rooted love for his family recipe for Old Fashioned Mustard Pickles. He “relished” the fond memories he had created in his life with this recipe which was always present during the holidays and the warmest Paxton family gatherings. He created the company in order to share this little known unique recipe with others. He began the process of refining the recipe and navigating the manufacturing process. In 2006 the first batch was manufactured under the name Pucker Smack. As Greg quickly found out, it was hard to accurately describe his product in an effective way to others. Many people he found were turned off by the name Pucker Smack and Mustard Pickles. He knew if people just tried the product, they would develop the same love for the unique flavor that he had. Finally Greg decided on the name of Grandma Della’s Sweet Garden Relish, named after his Grandmother whom the recipe was handed down from. Just as Greg knew they would, when others tried the recipe they fell in love with the unique flavor. 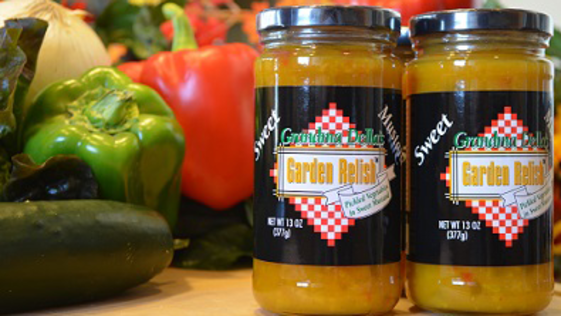 Grandma Della’s Garden Relish has been a successful product circulating in the gourmet foods market. After Greg’s passing in 2012, his loving wife and family have been continuing to deliver the legacy that Greg created. Greg was a kind hearted soul that believed in family, tradition, and sharing special moments with those you care most about. These are the values that his family will continue to embody in Della Enterprises. This entry was posted in Food and tagged Food, pickles on May 24, 2017 .